The nursing process is an interactive, problem-solving process. It is systematic and individualized way to achieve outcome of nursing care. The nursing process respects the individual’s autonomy and freedom to make decisions and be involved in nursing care. for providing ongoing nursing care that is adapted to individual client needs. The nurse and the patient emerge as partner in a relationship built on trust and directed toward maximising the patient’s strengths, maintaining integrity, and promoting adaptive response to stress. 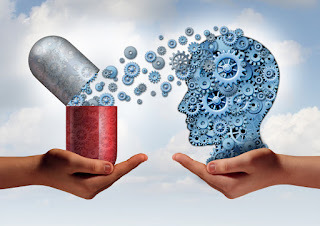 In dealing with psychiatric patients, the nursing process can present unique challenges. Emotional problems may be vague, not visible like many physiological disruptions. Emotional problems can also show different symptoms and arise from a number of causes. Similarly, past events may lead to very different form of present behaviours. Many psychiatric patients are unable to describe their problems. They may be highly withdrawn, highly anxious, ,or out of touch with reality. Their ability to participate in the problem solving process may also be limited if they see themselves as powerless. Individualized care begins with a detailed assessment as soon as the patient is admitted. In the Assessment phase, information is obtained the patient in a direct and structured manner through observation, interviews and examination. Initial interview includes an evaluation of mental status. In such cases, where the patient is too ill to participate in or complete the interview, the behaviour the patient exhibits to be recorded and reports from family members if possible, can obtained. Even when the initial assessment is complete, each encounter with the patient involves a continuing assessment .The ongoing assessment involves what patient is saying or doing at that moment. What the patient was thinking at that moment? Whether that behaviour makes any sense in that context? Whether the behaviour was adaptive or dysfunctional? Whether a change is needed? If the nurse has to interview the patient she should select a private place, free from noise and distraction and interview should be goal directed. Although the patient is a regarded as a source of validation , the nurse should also be prepared to consult with family members or other people knowledgeable about the patient. This is particularly important when the patient is unable to provide reliable information because the symptoms of the psychiatric illness. She should gather Information from other information sources, including health care records, nursing rounds, change- of shifts, nursing care plans and evaluation of other health care professionals. After collecting all data, the nurse compares the information and then analyses the data and derives a nursing diagnosis. A nursing diagnosis is a statement of the patient’s nursing problem that includes both the adaptive and maladaptive health responses and contributing stressors. These nursing problems concern patient’s health aspects that may need to be promoted or with which the patient needs help. A nursing diagnosis may be an actual or potential health problem, depending on the situation. The most commonly used standard is that of the North American Nursing Diagnosis Association (NANDA). The defining characteristics are helpful because they reflect the behaviour that are the target of nursing intervention .They also provide specific indicators for evaluating the outcome of psychiatric nursing interventions and for determining whether the expected goals of the nursing care were met. Helplessness, related to physical complaints, as evidenced by decreased appetite and verbal cues indicating despondency. Fatigue related to insomnia, as evidenced by an increases in physical complaints and disinterest in surroundings. Social isolation , related to anxiety, as evidenced by withdrawal and uncommunicative behaviour. The psychiatric mental health nurse identifies expected outcomes individualised to the patient. Within the context of providing nursing care, the ultimate goal is to influence health outcomes and improve the patient’s health status. Outcomes should be mutually identified with the patient, and should be identified as clearly as clearly and determine the effectiveness and efficiency of their interventions. The patient may view a personal problem as someone else’s behaviour. The patient may express a problem as feeling, such as “I am lonely” or “I am so unhappy”. Clarifying goals is an essential step in the therapeutic process. Therefore the patient nurse relationship should be based upon mutually agreed goals. Once the goals are a greed on they must be stated in writing .Goals should be written in behavioural terms, and should be realistically described what the nurse wishes to accomplish within a specific time span. Expected outcomes and short term goals should be developed with short tem objectives contributing to the long term expected outcomes. At the end of the one week patient will sleep well at night. At the end of the one week patient will eat properly and maintain weight. As soon as the patient‘s problems are identified, nursing diagnosis made, planning nursing care begins. In planning the care the nurse can involve the patient, family, members of the health team. Once the goals are chosen the next task is to outline the plan achieving them. On the basis of an analysis, the nurse decides which problem requires priority attention or immediate attention. Goals stated indicates as to what is to be achieved if the identified problem is taken care of. These can be immediate short-term and long- term goals. The nursing action technique chosen will enable the nurse to meet the goals or desired objectives. For example, the short-terms for a depressed patient is "to pursue him or her take bath”. The nursing action may be “The nurse firmly direct the patient to get up and finish her/his bath before 8 O’ clock. On persuasion the patient takes bath. This is an example of selection of the nursing action. Writing or recording of the problems, goals, and nursing actions is a nursing care plan. 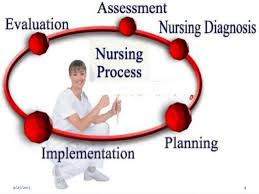 The implementation phase of the nursing process is the actual initiation of the nursing care plan. Patient outcome/goals are achieved by he performance of the nursing interventions. During the phase the nurse continues to assess the patient to determine whether interventions are effective. An important part of this phase is documentation. Documentation is necessary for legal reasons because in legal dispute “if it wasn’t charted, it wasn’t done". The nursing interventions are designed to prevent mental and physical illness and promote, maintain, and restore mental and physical health. The nurse may select interventions according to their level of practice. She may select counselling, milieu therapy, self-care activities, psychological interventions, health teaching, case management, health promotion and health maintenance and other approaches to meet the mental health care needs of the patient. To implement the actions, nurses need to have intellectual, interpersonal and technical skills. Dependent nursing action: Action derived from the advice from the psychiatrist. For example, giving medicines. Independent nursing actions: This is based on nursing diagnosis and plan of care, pursuing the patient to attend to personal hygiene. The continuous or ongoing phase of nursing process is evaluation. Nursing care is a dynamic process involving change in the patient’s health status over time, giving rise to the need of new data, different diagnosis, and modifications in the plan of care. When evaluating care the nurse should review all previous phases of the nursing process and determine whether expected outcome for the patient have been met. This can be done checking –have I done everything for my patient? Is my patient better after the planned care? .Evaluation is a feed back mechanism for judging the quality of care given. Evaluation of the patient’s progress indicates what problems of the patient have been solved , which need to be assessed again, replanted, implemented and re-evaluated. Dress, grooming, hygiene, cosmetics, apparent age, posture, facial expression. Hyperactivity or hyperactivity, rigid, relaxed, restless, or agitated motor movements, gait and coordination, facial grimacing, gestures, mannerisms,, passive , combative, bizarre. Speech-Quantity: - poverty of speech, poverty of content, volume. Mood (Intensity depth duration):- sad, fearful, depressed, angry, anxious, ambivalent, happy, ecstatic, grandiose. Affect (Intensity depth duration) :- appropriate, apathetic, constricted, blunted, flat, labile, euphoric. Ability to adapt and conform to present norms, rules, ethics. 25 Ineffective individual coping persecutory feeling related to mistrust Feeling of being misjudged , conspired against, spied upon , followed , poisoned, dragged, obstructed in achieving long term goals. Nursing Diagnosis: Risk for violence, self directed. Patient will refrain from suicidal threats or behaviour gestures. He will deny any plans for suicide Observe patient’s behaviour during routine patient care. Close observation is necessary to protect from self harm. Listen carefully suicidal statements and observe for non-verbal indications of suicidal intent. Such behaviours are critical clues regarding risk for self harm. Ask direct questions to determine suicidal intent , plans for suicide, and means to commit suicide .Suicide risk increases when plans and means exists Patient remained safe, unharmed. Absence of verbalized or behavioural indications of suicidal intent by the patient. Nursing Diagnosis: Ineffective individual coping, related to response crisis (retirement), as evidence by isolative behaviour, changes in mood, and decreased sense of well-being. Patient will identify positive coping strategies, such as structuring leisure time. Patient will combine past effective coping methods with newly acquired coping strategies Develop trusting relationship with patient to demonstrate caring and, encourage patient to practice new skills in a safe therapeutic setting. Praise patient for adaptive coping. Positive feedback encourages repetition of effective coping by patient Patient expresses trust in nurse-patient relationship. Patient discusses plans for use of past and newly learned coping methods. Nursing Diagnosis: Self-care deficit (grooming, dressing, and feeding) related to manic hyperactivity, difficulty in concentrating and making decisions: as evidenced by inappropriate dress, and dysfunctional eating habits. Patient will dress appropriately for age and status. Patient will eat and drink adequately to sustain fluid balance and proper nutrition. Offer assistance for selecting clothing and grooming to provide input and direction for appropriateness of dress and hygiene to preserve self-esteem and avoid embracement. Encourage and remind patient to drink fluid and to eat food to focus the patient on necessary feeding activities , to prevent dehydration and starvation. Provide recognition and positive reinforcement for feeding/dressing accomplishments to reinforce appropriate behaviours and enhance self-esteem. Patient dresses self appropriately and maintains hygiene. Patient eats and drinks fluids necessarily to maintain physical health. Kapoor, B. (1994). A Text Book for Psychiatric Nursing: Chapter5, Page 223-224. Foortinash, Hoolodey-Warrant. Psychiatric Mental Health Nursing, 1996: Chapter 20, page 279, 482. Gail.W.Stuart, Michal T. Laraiya. Principles and Practice of Psychiatric Nursing 1998: Chapter 10, Page 178. Katherine N Fortinash, Patrica N Hooliday-Worret. Psychiatric Nursing Care Plans 1991: Chapter 1, Page 1.